(Photo: Eceumenical News / Peter Kenny)Dr. Sue Parry addresses a conference with the United Nations on faith based organizations and health care held in Geneva on May 21, 2015. When deadly Ebola hit West Africa last year, faith based organizations, were first on the ground to deliver assistance to those smitten, some time before the United Nations and international organizations arrived. There was a time lag before the United Nations and other organizations recognized that the FBOs, many of them run by churches, are a vital cog in healthcare and fighting Ebola in that region. The United Nations did not leverage the capacity or the local knowledge of the non-governmental organizations and FBOs that have long histories in the affected countries when Ebola emerged, say key meidcal people who who took part in the response. 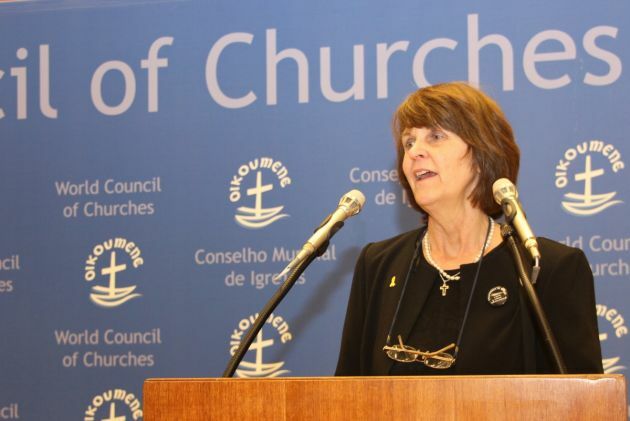 "One of the biggest challenges, in relation to the U.N., most international agencies and governments, is the preconception and prejudice that associates FBO humanitarian services with proselytization," Dr. Sue Parry of the World Council of Churches told a recent global conference on religion and sustainable development. "However, FBOs provide essential complementary services to government. Their service is both a mandate and an expression of their faith." Unfortunately, there was a long gap in the Ebola response from U.N. agencies, she said, yet there were many FBOs already on the ground. The Christian health service providers were on the front line, and many paid with their lives for the services provided, said Parry. "They were key in the provision of the non-Ebola essential medical services." Representatives from the World Council of Churches were, however, key speakers at the Global Conference on Religion and Sustainable Development held in Washington, D.C., from July 7 to 9. Representatives of other FBOs such as the Muslim Charities Forum, and Christian organizations such as Caritas, the Act Alliance and IMA World Health attended the conference along with World Bank President Jim Yong Kim. In a session entitled "Ebola and HIV/AIDS," Parry a medical doctor from Zimbabwe and the WCC health and healing program executive, spoke about faith-based responses to Ebola and HIV. She noted how religious leaders were among the first to respond to the Ebola epidemic. They used platforms such as inter-religious councils, interfaith health task forces, malaria and polio immunization networks, HIV networks, pulpits and mosques, and major festivals and religious events. These included Christmas, Easter and Ramadan, to raise awareness, address stigma and to communicate the need for social behavioural change, especially in burial practices. "Their early engagement with chiefs and local community leaders created access to villages that otherwise may have been hostile to such messages coming from others less trusted," said Parry. Both the religious leaders and the Christian health providers recognized early on the necessity for community understanding and ownership of the Ebola response, explained Parry. Ebola is a classic example that a technical approach alone will not rapidly and effectively contain a disease that essentially requires a change in behaviour. "Community engagement is essential and the faith leaders were the first to recognize and act on this," said Parry.